Juventus is the toughest opponent we could have drawn, but I have a lot of confidence in Ajax winning the Champions League. It is also a serious test for Ronaldo. If he wants te go down in history as the greatest of all time he has to prove himself against Matthijs de Ligt. 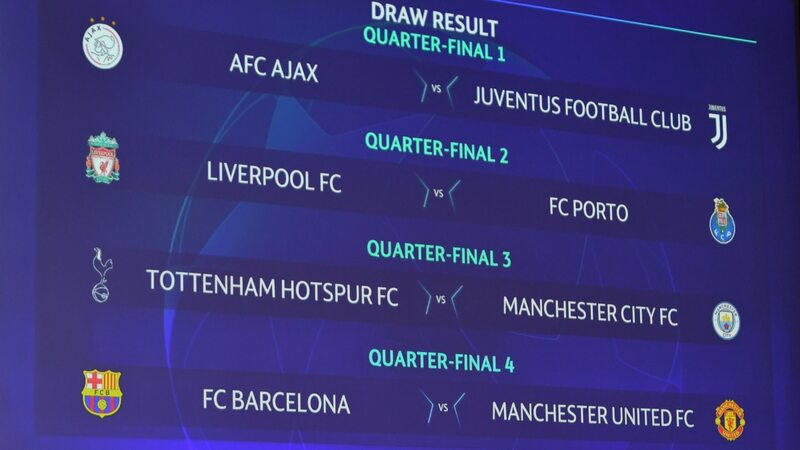 My head says Juve, Liverpool, City and Barça; my heart says Juve, Liverpool, Spurs and United. Juventus, Liverpool, City and Barcelona. @dikketuur_nl don't know that much people who doesn't want city to want it. Play Tottenham and Barcelona Champions League Final in. @sergiu-il I agree to what you're saying. But this isn't an irreparable scenario for the other major leagues. With the right marketing and sponsorship, the other leagues can quite easily match it. I personally would like nothing more than there to be a sort of parity with regards to TV deals so historical clubs don't get left behind. And would certainly like to go back to those days where anyone can beat anyone in the Europe, and any club, big or small, has a good chance of lifting the champions league. But you should agree that a lot of that is down to no-so-good marketing within the respective league as well. La Liga and Serie A are trying to rectify this and this situation is certainly redeemable. But this in no way is as dangerous as oil-money. Buy a no-name club, punch all of your oil-money into it for 10 years (which is close to £1.5 billion pounds in City's case btw), and voila, here's you champions league. They don't have the fan-base or the general income to validate this income. Hell, City even built a chain of subsidiary clubs to funnel their finances and evade trouble. What do you think this all of this does to the history our so called historical clubs? Will it really mean anything anymore? City and PSG are basically playing the game on cheat mode. When you start the game enter the money cheat, and you got infinite cash. Then when you win a trophy, it feels empty, doesn't mean anything. @tony-alvera I agree wholhearthedly with you, but you forgot something, I'm not against oil money, I'm against breaching FFP rules, bypassing them so you get advantage over your competition, funneling money in feeder clubs (check Nakajima he's going to Qatar for 35M, the owner is the same of PSG), and god knows what other tactics PSG & City used to get where they are. My problem is not with the fact that there are rich people buying clubs and making them better, I have no problem with that, there have always been clubs like these thorought the history, but you can't ignore and say f the rules and laugh in everyone's face afterwards, that's what City and PSG are doing. Both oil dollars and TV-contracts ruined football. @osmsüpermenajer It would be a great final!